SAP HANA database developers can convert rows into columns using SQL Pivot Table queries in SQLScript. This SQLScript pivot table tutorial shows how to build sample pivot table query on your HANA database easily. Let's first create our sample HANA database table as column table with following CREATE TABLE command. As seen in database table field structure, ABAP programmer may want to build a SQLScript Select statement that will display the Variant values in seperate columns for each product. Unfortunately, if dynamic pivot table query is not used database developer should define the column names which are corresponding values of column values explicitely as seen in following SQLScript code. SQL CASE command enables moving quantity value under a new field for that variant color. If database developer is interested in only 5 colors, they can be listed in SELECT fields as seperate columns using CASE statement. 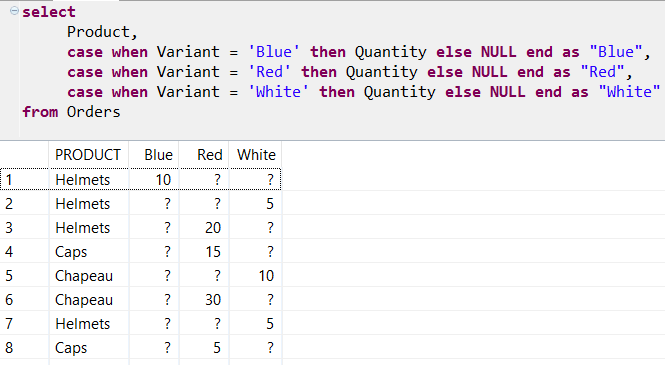 case when Variant = 'White' then Quantity else NULL end as "White"
To complete SQLScript Pivot query example, SQL programmers can use SUM() aggregate function based on Product field so that total quantity for each product color is displayed under the column name for that variant. SUM(case when Variant = 'White' then Quantity else NULL end) as "White"
Here is the output of the HANA databasee pivor query using SQLScript sample. Of course, if the pivot table columns are not known before or the pivot columns are too many for SQL developer to code as SQLScript, dynamic pivot queries should be build and executed on HANA database.